So for the last two weeks or so I disappeared into renovation-land. As some of you may know I still own my father’s condo in South Florida. He died about four years ago, and we decided to keep it as a (very expensive) vacation place. Some would call it a “money pit”. Two years ago, when R. was unemployed for a few months, we decided to start upgrading the place that seemed to have not been upgraded since it was built in 1973. The kitchen’s dome lighting was vintage, and the appliances were slowly taking leave of their functionality, one by one. 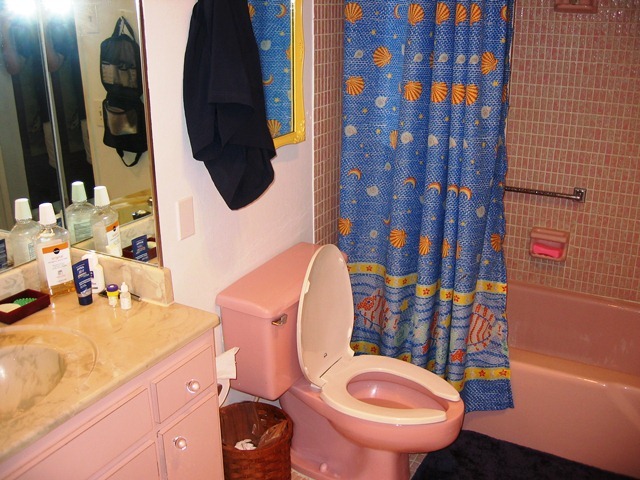 The pink bathroom was classic, too. So thanks to my unbelievably resourceful and flexibly unemployed husband, we managed to redo the kitchen and the two bathrooms within about four months. He flew from Europe to Miami five times within that span of time to supervise the construction. This past September we attacked the project head on. R. is no longer unemployed, but he now has a job where he can literally take every fifth week off. (PS. : I want one like that too…) So he flew over to Miami and started the long and arduous task of covering every ceiling and vertical flat surface within the four walls of our condo with a fresh coat of white paint. It took him eight full days. But once the walls and the ceilings were white again, we noticed that the closet doors, room doors and door frames were a kind of seedy beige-y color that depressed us. 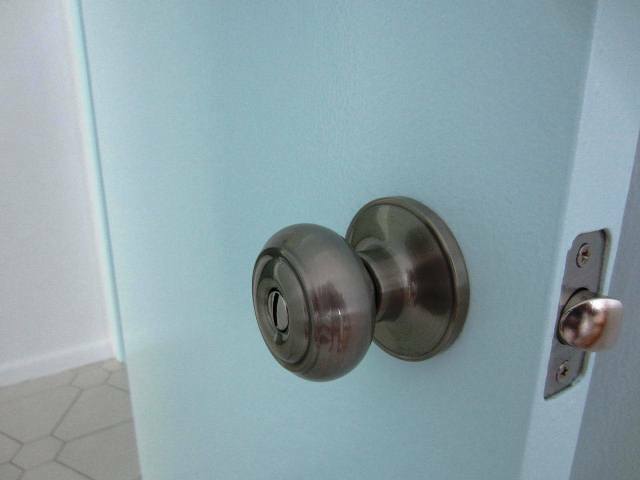 And the doorknobs, fashionable in the 1970’s, I’m sure, just had to go. A second working vacation was planned. We arrived a week and a half ago, and in those ten days the place has turned from dowdy to rowdy. For the trim and every other surface that needed something fresh, we chose an airy, light turquoise that carries the name “ionic sky”. I kept calling it “iconic sky”. It looks unbelievably Florida-y, South-Beach-y even. Oh-so-cool. But renovating comes with its pitfalls, too. For example, I never knew painting was so hard, that one can make so many mistakes, and that it is possible to get a cramp in one’s hand from holding a paintbrush for 8 hours every day. I thought that kind of thing only happened when you were writing exams at school. During our renovation extravaganza, no day was complete without a visit to one of our two local Home Depots. We always seemed to need some tool / widget / screw / nail / cable / switch / outlet / paintbrush / cover / glue that we did not have at home at that particular moment. Of course, he meant well, and I love him for it. And hey, if I don’t get a job in my field by the end of January, maybe I can make replacing doorknobs my new career choice! Beautiful! You are so close yet so far! Actually, if you want to know the truth, we flew DIRECTLY OVER Naaahfick on our way to Florida. Took USAir ZUR-PHL-MIA. I looked out my window and saw the carriers in the harbor. I waved. Didja see me? I would put this on your resume. Twice. Why thank you! I will!